I just returned from a truly wonderful workshop and I had so much fun that I want to share it with you. 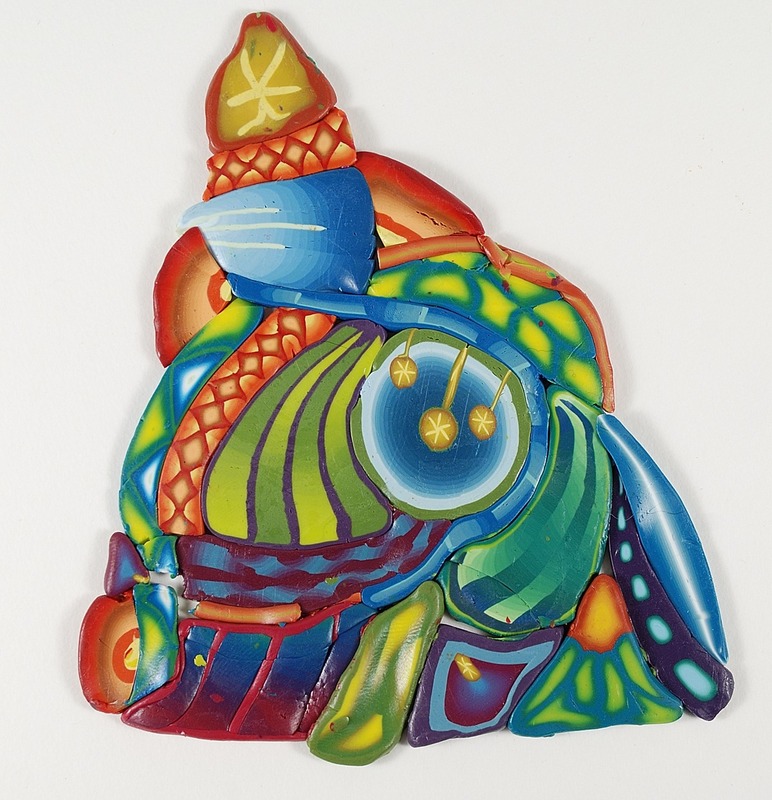 Carol Simmons is a talented polymer clay artist who gives workshops on a variety of subjects such as Hidden Jewels, Fantasy Flowers, and Kaleidoscope Veneers. But it’s her 6-Day Master Cane Class that is the “Holy Grail” of workshops. I’ve been hearing about this workshop for years, but it was never held anywhere close to me. Last fall Carol was looking for a location to hold the class and several midwestern clayers convinced her that Kansas City was a good choice. It was. The class sold out in less than 24 hours. I was lucky enough to reserve a spot. For once I was in the right place at the right time! The class was held September 12-18 at Heartland Retreat Center in Parkville, Missouri, just north of Kansas City. We had excellent facilities that made for a wonderful stay. But enough about that…let’s get to the clay! Carol’s Master Cane Workshop starts with an inspiration picture. Each of the 13 students chose an image that would serve as our color inspiration. We used it to mix all our colors and blends that we would then assemble into a master cane. This master cane is then used to create an endless variety of kaleidoscope patterns. I won’t reveal too much of Carol’s teachings, but let’s just say that it was a lot of work, and oh so much fun. Here’s my inspiration picture and my mockup cane (right) along with my finished master cane, just after I cut through it to see what was inside. Here’s my mockup cane that I used to help decide how I wanted to arrange all the elements. This is half of my finished master cane. And now we start thinking about kaleidoscope designs! The cool thing about Carol’s Master Cane Class is that you learn how to make infinite kaleidoscope designs from one master cane. This stage was my favorite part. Each of us had great fun arranging our canes to form new designs. Here are some designs that all came from my own master cane. This was an information-packed class and we really didn’t have time to create a lot of finished pieces. But I did make one gorgeous lentil bead pendant. I also made a pendant and earrings (yet to be assembled) from scraps. The best part of getting together for claying retreats and workshops would seem to be the clay. But I think it’s the people. It’s good seeing old friends again and it’s wonderful meeting new people and getting to know friends that you already know online. My work table was right next to Krithika Parthan and had a wonderful week talking and joking like we’d known each other forever. She is hysterical! Clayers came from at least nine states to attend this workshop, so there were lots of stories to share, too. 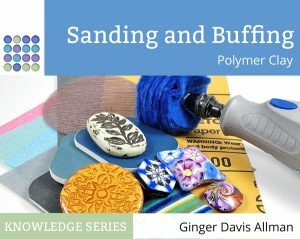 It always makes me so happy at claying events to realize that these strangers are now my new friends thanks to a shared love of polymer. Some of the nicest moments in the week were when we were all working on our projects, completely “in the zone”, the room filled with the comfortable silence of friends busy at work. It never lasted for long, though, because this group had a wicked sense of humor. We laughed a lot! Here’s the group that took Carols Simmons’ 6-Day Master Cane Class, September 12-18, 2016, in Kansas City, Missouri. Photo courtesy of Ann Marie Donovan. Each person’s master cane was very different. Most of us used different inspiration pictures, but even the two that used the same one had very different outcomes. Each cane reflected the personality of the maker and the colors of the inspiration picture. Here is everyone’s master cane from the Kansas City workshop. Want to Take the Class? This is definitely not a beginner level class. You need to have a fair bit of experience with polymer clay. Nothing is particularly difficult, but there isn’t time during the class for explaining the basics. And it’s a 6 night (7-day) class. We worked full days and into the night. It’s not one that you can attend for only part of it. But if you’re to a point in your art journey that you want to delve into a subject and really learn and understand it, and can dedicate the time and finances to it, I heartily recommend this class! Carol is currently scouting for future workshop locations, so if your area has sufficient interest, let her know. Carol said that she will only offer this class for another couple of years, so don’t put if off if you get a chance to take this class! I had so much fun sitting next to you Ginger!! It was great to finally meet you! I’d almost forgotten that I actually met you just last week. Isn’t it funny how that works? How can you forget something like that! Ha! But seriously, I know what you mean. We get back into our normal routine and it all seems so far away. I loved spending the week claying with you. We have to make this an ongoing thing. Next workshop, I’m sitting next to you again!! I meant it feels like we’ve known each other forever, but in reality we met just last week!! Oh I’m all for meeting up again and sitting next to each other! I’m sure I’ll have a whole set of new questions to bug you about! And you need to make it out to the Northwest sometime for sure. Beautiful work! I love all of those wonderful canes! It is a dream of mine (and has been for years) to attend this class…..”sigh” maybe one day. Thanks for sharing the pics. Find a way, if you can. It is a wonderful class and Carol readily shares all her years of experience with you. It was SO worth it. What a lovely and comprehensive review, Ginger. Thanks so much! And thank YOU, Carol. The entire experience was delightful and honestly, food for my creative soul. I loved learning so much from you! Looks like a wonderful creative experience. Carol would you consider bringing your wonderful skills to the other land of Oz? I know a few caners who would think their lotto ticket had come in if that were to happen! Inspiring to see all the wonderful canes created by this group. That was a lovely read and so great to see everyone’s colourful master canes. Glad you all had a super time. Thanks Ginger. Thanks Ginger for the review, our very guild president, Ann Marie Donovena, was present and came back to let us know what a wonderful time it was. Ahh if only my claying experience was enough. Loved the article and the amazing canes! I made this class once and I wouldn’t mind making it again (really). Its was so much fun and I used the master cane lots of times in lots of pieces. It was money well spent. I am amazed at the variety of designs you got from one cane! Please let me know when a new Master Class is in the Chicago/Milwaukee area. I’d love to attend and experience the fun and learning. Thank you very much!